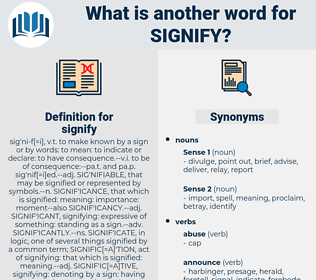 What is another word for signify? Indicated, illustrated, demonstrated, Manifested, affirmed, conveyed, Mentioned, said, pointed, revealed, Displayed, showed, noted, sent, declared, Gave, Commented, Objected, raised, Claimed, voiced, stated, made, expressed. indicate, indicates, according, mean, represent, imply, implies, signal, designate, denote, mark, entail, demonstrate, suggest, express, expressed, constitute, sign, identify, show, specify, involve, confirm, symbolize, spell, reflect, serve, describe, commemorate, refer, pose. leave alone, suppress, listen, hide, withhold, refrain, conceal, refuse, cover, bottle up. They do not signify now: no snow or cold can ever signify any more. snap, snap pea, sniffy, ski jump, snoopy, samba, sum-up, snub, snip, shine up, snipe, sine wave, sannup, skin pop, snow pea, scampo, swamp bay, snob, sea nymph, swamp, sign off, snip off, sonny boy, shampoo, succumb, skimpy, sawn-off, snap off, synovia, sunup, snap up, sign up, sinopia, snuff, snobby, shen-pao, sump, sniff, snoop, skim off, swampy, snafu, scampi, sum up, skimp, snappy, scamp.